Picture Book Abundance: Will It Ever Happen? Can you envision book abundance, worldwide? Given the importance of good picture books to beginning readers, the goal of establishing picture book “abundance” is one that everyone can endorse. Supporting it as a cause and making it happen, however, are two very different things. Do the math. There are over 7 billion people in the world. Perhaps 10% of those people are birth to age 8, the ages for which picture books tend to be most important. That’s 700 million children. Now, many of those have plenty of picture books, but more of them do not. However, for the sake of conversation let’s say 350 million children who need access to abundant picture books don’t have it. So, how many picture books qualify as “abundant” enough to support each of those kids in learning even basic reading ability? A convenient and defensible number is 100. That comes from Evans and colleagues(2010) who discuss what they call “family scholarly culture” a terrific concept that describes families that read and discuss books together. In their longitudinal study of 27 countries with data covering 20 years, Evans et al display graphics indicating that almost regardless of parent education or income, the number of books in the home is the best predictor of school success, and each book added to the home, up to just about 100 seems to increase that prospect of academic advancement. So, 100 books is certainly abundant enough. So let’s see, 350,000,000 kids x 100 books, that’s 35 billion books needed. Oh, and that number increases each year with the addition of another 4 million or so new children added to the world’s population. Sadly, the Bill and Melinda Gates Foundation doesn’t have enough money to make even a small dent in that, even if they could get books (written, edited, printed, bound, stored, and transported) at a cost of $1 apiece, they then have to get the books into those children’s homes. So, let’s face facts, book abundance – 100 books for every child in the world – will never happen… WAIT!…or will it? The alternative solution to the one I posed above of course is digital books. By leveraging the rapidly expanding digital network system around the world and then populating a library with 100+ creative-commons copyrighted, mostly non-fiction (the intention being to create generally universally interesting content) picture books and then translating and narrating those books in nearly 7000 languages (I know, I know, but stay with me), it could work. Look at the Global Book Publication Matrix, below. 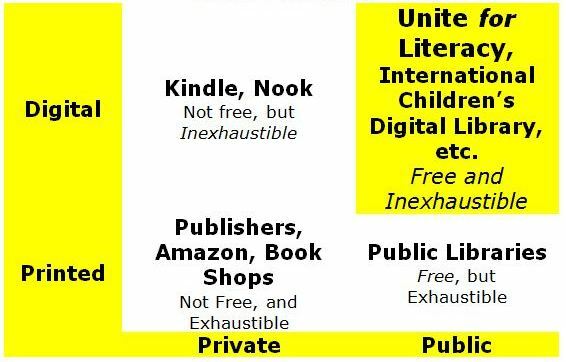 Digital books can be created that are offered as a Global Public Good, i.e., A resource that is free for all (no login) and inexhaustible (digital). That’s the goal of Unite for Literacy, a small “social enterprise” company in Colorado that has a free library that went online in August 2013. Unite for Literacy to date actually has more than 100 books available in a free online library (www.UniteforLiteracy.com) and each one offers English text and is narrated in up to 18 world and indigenous languages. 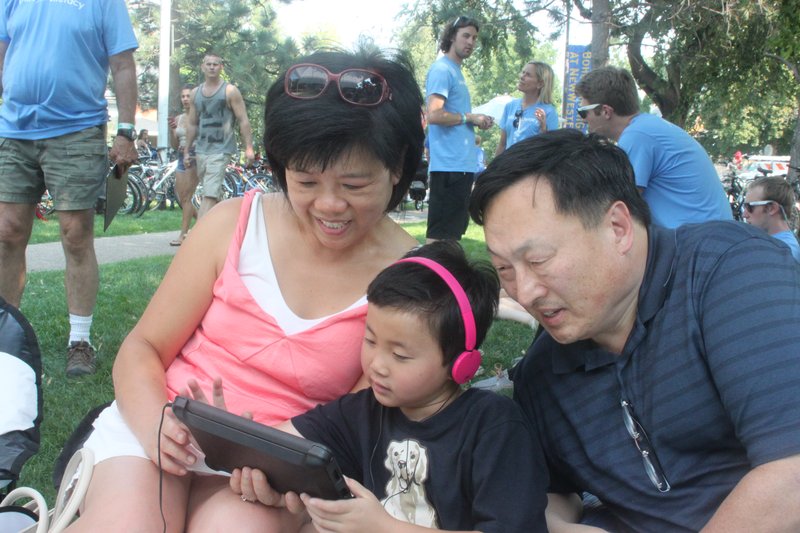 With the current languages, nearly half the families around the world can access the library and read the English book, listen to the English narration and/or listen to a book narration by a fluent native speaker of their home languages. Plans include adding books created in collaboration with the content experts at local cultural institutions (museums, galleries, performance groups, sports teams, etc.) and of course adding more languages. Japanese was just added, Turkish and Slovak are on the way and Navajo and Cherokee are in the works. Also, when time and budget permit the books will be readable in the all of the world’s languages of instruction (about 200 by our count) as well. Unite for Literacy is supported by generous corporate and organizational sponsors, all committed to world literacy and actively advocating for literacy in their communities. It is further being promoted by a growing number of educators, librarians and advocacy groups that take the online library link out to the communities that they serve. Sponsors are publicly recognized in the communities that they serve and on the companies’ websites, as well as in the library. Sponsorships are available for providing existing books for new language communities, for underwriting book authors to create new titles or to advocate for particular books with which they wish to be associated. 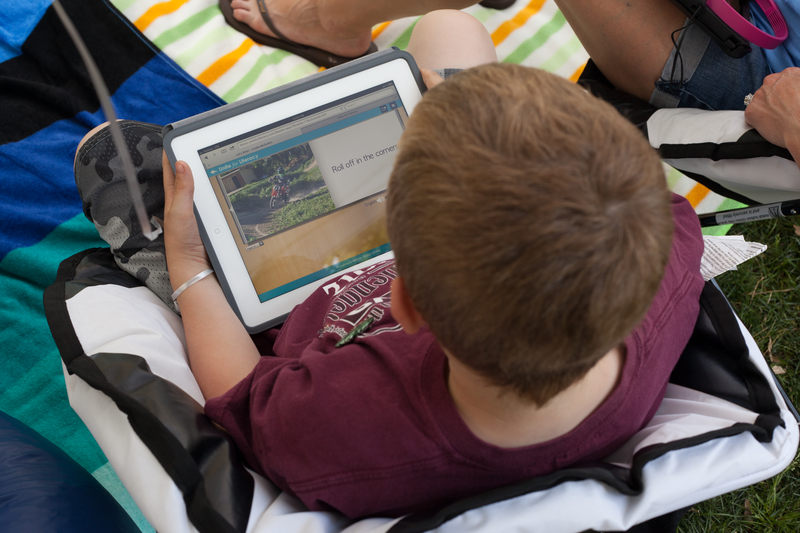 Community literacy advocates take advantage of additional web resources to promote family readership and the accessing of books at home and school. 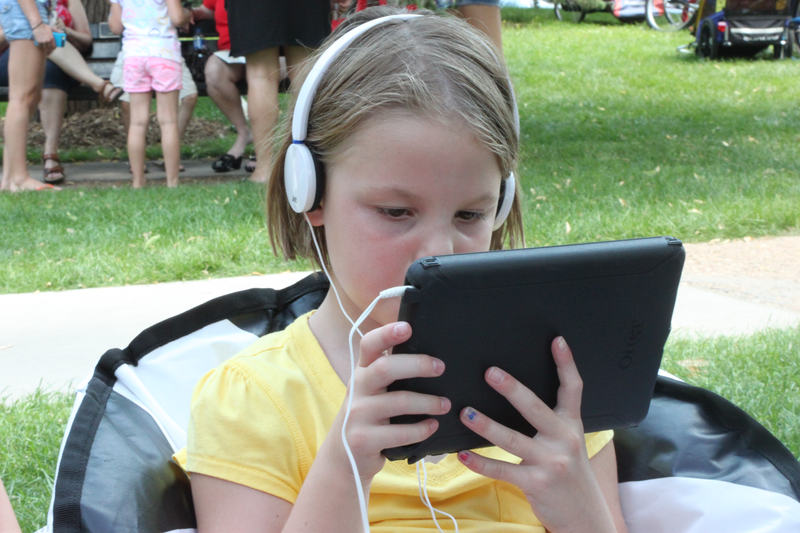 Free, digital, narrated, picture books are the game changer. There are efforts well under way as this is written that seek to create inexpensive smartphones and free or nominally priced mobile Internet access around the world. Those efforts, backed by the titans of digital communication, will in a very few years put the riches of the Internet within reach of even those living in poverty. 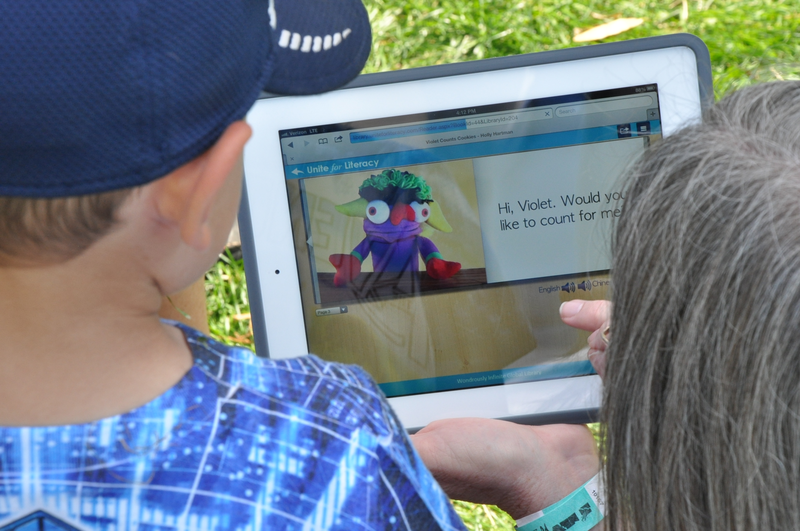 When these digital books become eventually available in all 200+ world languages of instruction and those texts are accompanied by on-demand narrations in the almost 7000 indigenous and immigrant mother tongue languages found in homes that send their children to those instructional settings, then in fact worldwide picture book abundance will be a reality. Unite for Literacy is working to make a contribution to that effort. Evans, M., Kelley, J., Sikorac, J., & Treimand, D. (2010). Family scholarly culture and educational success: Books and schooling in 27 nations. Research in Social Stratification and Mobility, 28, pp. 171–197. All images in this post courtesy of Unite for Literacy. We’ve just made a video raising awareness that Literacy, or illiteracy is still an issue across the world today. Thank you Chris and Cambridge Assessment for sharing this informative video and Book Aid International. Keep up the great work!